Overview: Tasting wine to progressive metal and alternative music along side wearers of Tool, A Perfect Circle and Puscifer T-Shirts is typically uncommon in the wine world, unless of course you are like me and recently went to see the band Puscifer perform live. There is nothing better than holding wine in one hand and flashing the ‘horns’ \m/ with the other. There are people in this world who never stop creating. Maynard James Keenan is one of those people. For those who do not know, Maynard James Keenan is the singer and frontman for Tool, A Perfect Circle and Puscifer as well as the winemaker/owner of Caduceus wines, Arizona Stronghold wines (alongside Tim White) and Merkin Vineyards. He is a man that many people idolize but is against the hero worship of celebrities these days. With this in mind I will say that he is a man that I admire. Maynard is not just a figure head of these wines but their creator. These wines have long been at the top of my list to taste, so with a Puscifer ticket in hand I found myself at the Jubilee Hotel in Brisbane with an appetite ready to be whet. To the soundtrack of Maynard’s voice, alongside fans of Tool, APC and Puscifer I tasted five more of Maynard’s creations. Arizona Stronghold Mandala White 2011 (blend of Rousanne and Viognier): This take on the traditional Rhone blend has a nose of talc, jasmine and honeysuckle. The talc character carries through to the palate joined by peach, savoury spice and good texture. 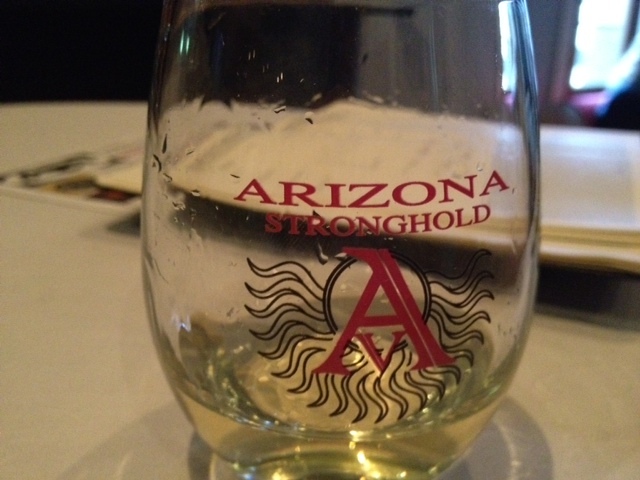 Arizona Stronghold Dala Chardonnay 2011: Vanillin oak and stone fruit on the nose. The palate is soft with hints of nectarine and some citrus. Arizona Stronghold Magnus 2011 (blend of Sangiovese/Merlot/Cabernet Sauvignon/Petit Verdot and Cabernet Franc): A bouquet of sweet cherry and cinnamon. Cherry and spice on the palate with undertones of pepper and savoury spice. Finishes with grainy tannins and a touch of game. Arizona Stronghold Dala Cabernet Sauvignon 2011: Cassis, plum and blackberry aromas. Initially quite plush on the palate with fruit characters of blackberry and plum but menthol and soft tannins add an extra layer of complexity. Great balance. Arizona Stronghold Mandala Red 2010 (blend of Cinsault/Syrah/Petit Syrah/Counoise/Grenache/Viognier): A veritable fruit salad but essentially a Rhone Valley style blend with a nose of macerated cherries and tobacco. Cherry, plum and savoury spice flavours on the palate. Caduceus Anubis 2010 (blend of Cabernet Sauvignon/Petit Syrah/Syrah): A robust nose of cassis and plum with a full bodied palate boasting characters of plum, blackberries, spice and cedar with grippy tannins and persistent finish. Spitting:optional will be taking a short break while I go on holidays. See you all in three weeks.